Body becoming was the latest exhibition of in a series of conversations, workshops, and performances conducted by House Ltd. Curated by Natasha Jozi and spread over the plan of a residential building, each work in the show was expertly designated a space with enough room to breathe and create its own context. Interspersed alongside these long performances was a sequential program of shorter works which helped circulate the flow of the audience throughout the building. As a collective, House Ltd has been dealing with ideas of the ‘the live as a serious artistic medium’, particularly as this temporal condition intersects with the body. It imagines the body as medium, a proposition that I find of productive value, particularly in its seeming contradiction: presence has been typically assumed as something that is direct and unmediated. To imagine it as the medium itself implies a degree of distance or removal from the subject. I use this interpretative framework to map the many iterations of resolving the position of the embodied subject as manifested by works in the exhibition. Because any conception of the artist subject is intrinsically bound with conceptions of audiences, I also hope to consider the new kinds of viewerships that these works create. In Platonic thought, “true being” as a form of full presence is the surest way of knowledge as opposed to appearances which can be illusionary and false. This presence is is an ideal, originary form. Subsequent critique of logocentric metaphysics of presence by Jacques Derrida is also on the grounds that speech is privileged over writing because it seems closer to the origin where as a writing is another degree of deferral. Leaving the complications of textuality aside, it is important in this context to evaluate what is meant by the metaphysics of presence. Full presence is singular, authentic and contains an essence of the subject without which it wouldn’t remain what it is. Full presence is an encounter in time. The subject is Here and the clock strikes Now. It is the source from which deferred formats of representation can spring. Thus, it is the final central referent. In his famous “Allegory of the Cave”, Plato describes the world as only a shadow of the ideal Form. If full presence is this ideal Form, encountering it is aspirational at best. It is impossible to pin this abstract and supposedly immutable quality down in the many representative iterations of reality we come across. The presupposing of this ideal authentic source however provide does create a moral desire. One has to strive to minimize mediation to attain this state of “true being”. In ‘Metaphor’ by Haider Shah, we see a manifestation of this desire. The artist dug a hole in the ground, lay down in it and then earth was piled atop him by two men. Shah was buried for a few minutes before the same men and a charged unorchestrated member of the audience dug him out. While Shah was being interred, there seemed to be a progressive gain in the aura and affective presence of his body. As he became increasingly inaccessible to sight, the possibility of representation or mediation was also erased. 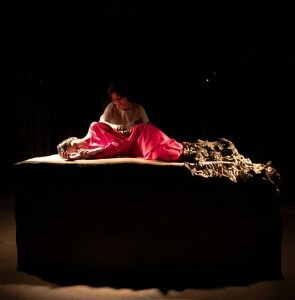 As the audience waited and watched a buried man, what was left behind was a larger abstracted presence in a shared pregnant pause. The performance called ‘Metphor’ was decidedly not one. There was no elsewhere to which it led in that moment. Rather, it was what it was: the automatic affect of a precarious body under physical duress. This direct unmediated experience perhaps only suggests metaphor after the fact when the audience has breathed a sigh of relief, moved on and interpretation regains control on memory as well as the photograph. This leads me to consider one of the primary dichotomies of the audience when the live is considered an artistic medium. There are those that are held in the bonds of the moment and then others who encounter the retelling: the photograph, the oral account or the textual interpretation. There are losses and gains for each depending upon the format and intention of the work itself. 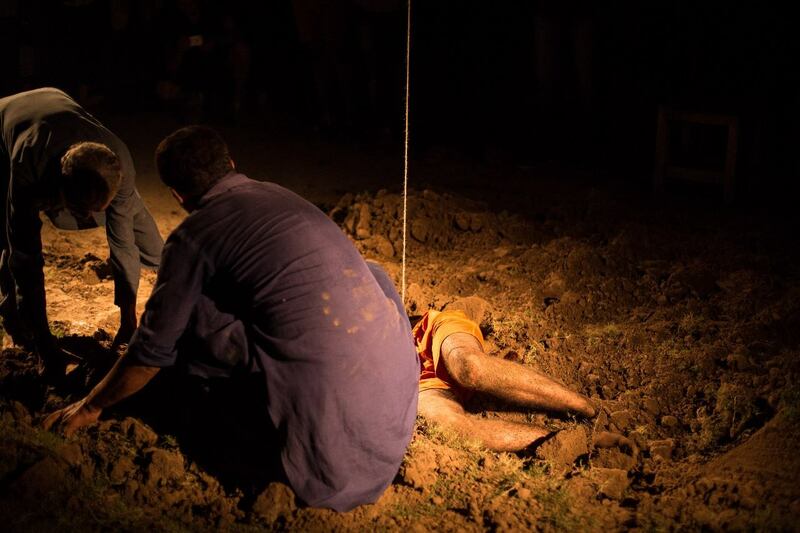 In many performances on this evening, the artists contrived situations of danger, vulnerability, harm, exacting discipline and compelled participation to challenge the comfort of the bystanders who could no longer claim innocence. In a retelling this visceral shared experience is lost and transformed into an aesthetic and cerebral exercise. 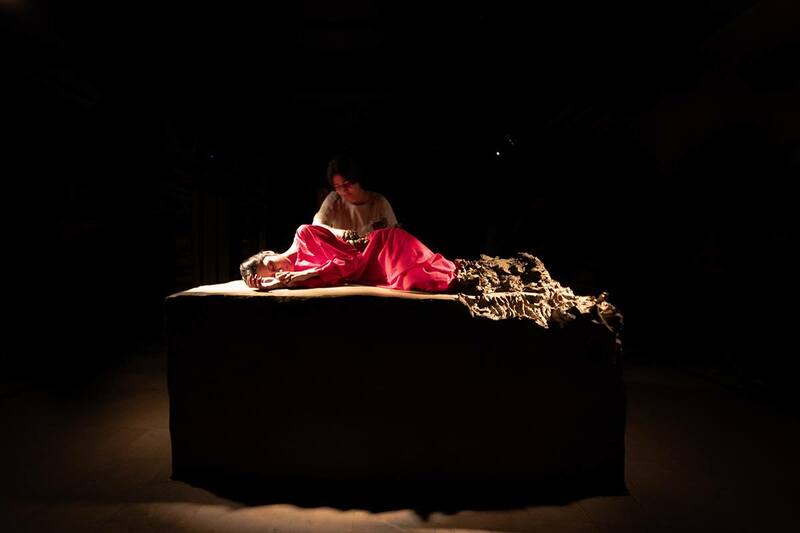 In “The essence of what fades”, Kanwal Tariq engaged another female participant, dressed in red who lay passively upon a rectangular clay pedestal, reminiscent of carved supine women in the history of western sculpture. Slowly, Tariq carved out the pedestal itself with her fingers and smeared the mud upon this sleeping figure, engulfing her completely. 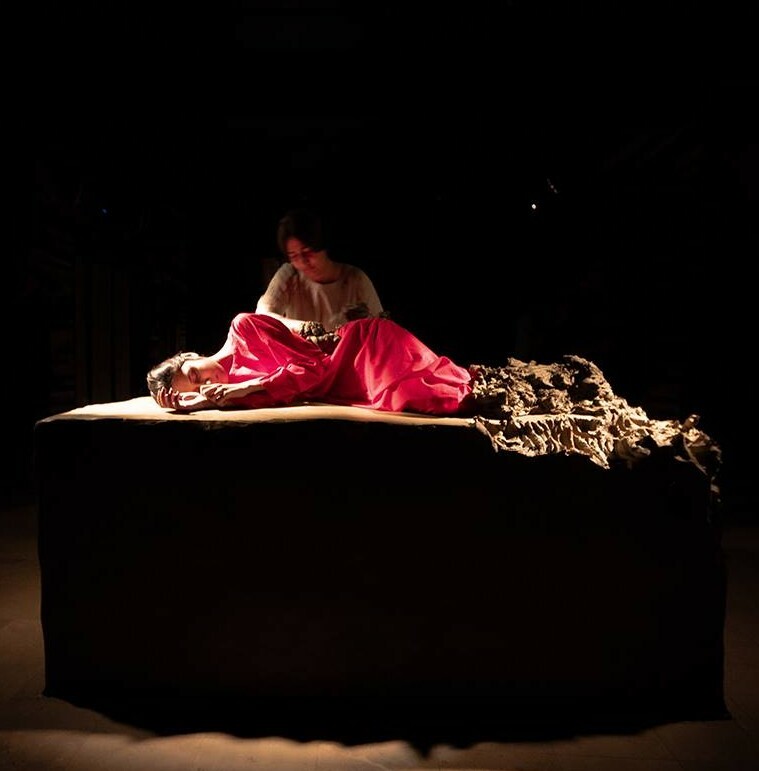 Tariq’s exercise was a long form version of striving towards a full presence through an entombment of a live body. Because of the prolonged duration of this piece, the gain in physical aura was barely perceptible as you observed. However, it was striking if you returned after considerable time had passed. This slowness allowed metaphor – an elsewhere, to exist simultaneously with action. Tariq’s incessant repetitive gestures mimed largely invisible gendered labour such as kneading flour in a kitchen, or mud construction in a village. Her circular movement around the pedestal, a kind of tawwaf reinforces the singularity of the female body on the pedestal. And yet the absolute surrender of this sleeping figure in a state of lethargy robs it of any agency, presenting it only as an inanimate object. However, this equation flips when the transfer of mud from pedestal to body begins to blurs the distinction between the two. Now, any slight tremor of the female figure is magnified under the weight of all this earth. Tariq and Shah move in a similar direction i.e. towards a center that is closely aligned with the body and contains the subject. Is it at all possible to produce authenticity with a move away from this centre? This may require any of the following presuppositions: Firstly that successive conversions of subject through media are lossless. These are not evasions or deferrals but can actually unearth a new immediacy to the center that is unknown through direct sense alone. Some attempts at such an immediacy include surrealist automatism, and the transcendental gesture and physicality of paint in abstract expressionism. In “Song to the siren” Nayab Naveed, attempts something similar through the mediation of language. Standing amidst letters hung from trees, Naveed delivered a deeply affecting oration about sexual violence, coming of age, erasure, and the sea as a vessel of home, sublimity, quiet contemplation as well as disaster. 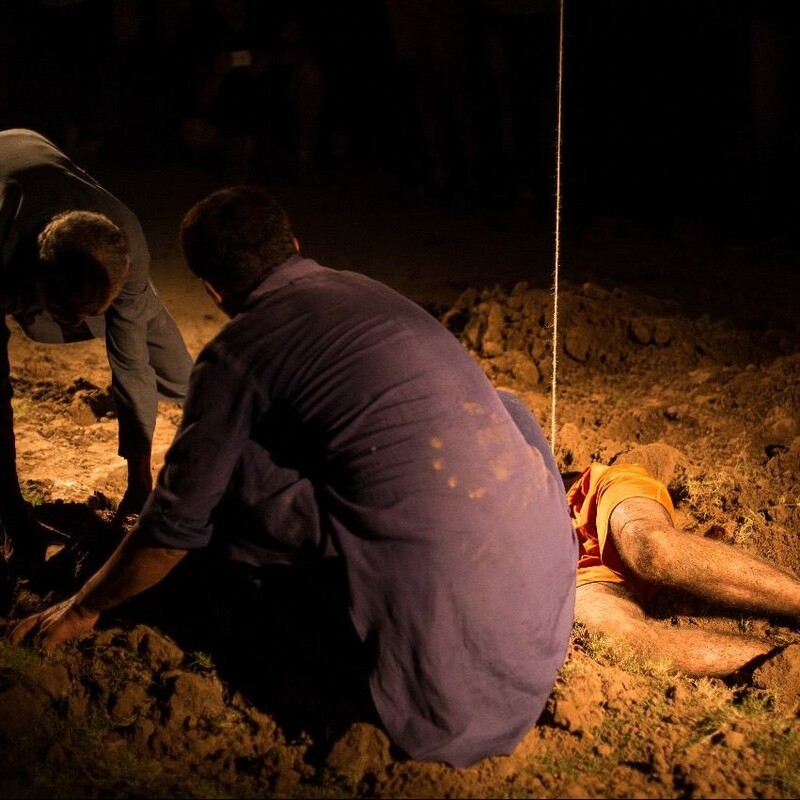 At some points during the performance, Naveed dug up dead birds from the ground, placed them delicately upon fabric and entrusted a member of the audience with these. 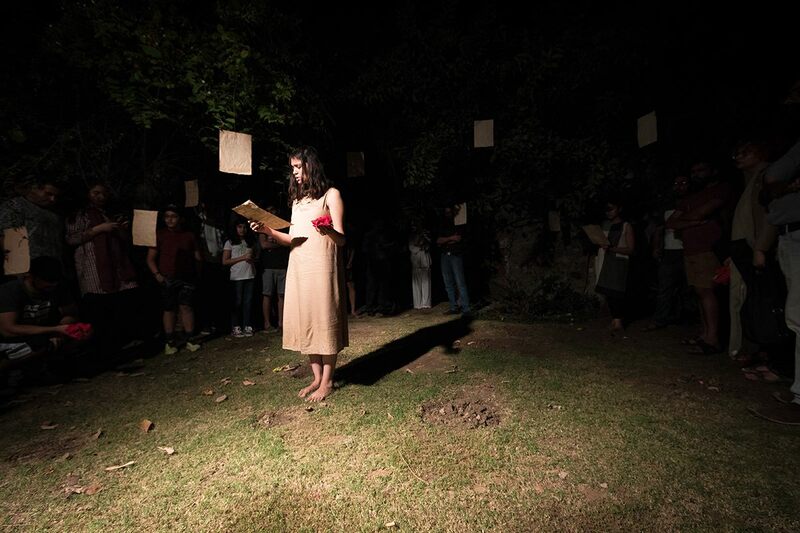 Naveed’s performance deeply linked with notions of direct authorship, and autobiography was most effective through her own speech, the quiver in her voice and the fugitive eye contact she made with her audience. Language intervened between the viewer and the body but instead to creating distance, it confessed. In contrast, the letters and the birds seemed like stubborn inanimate props that refused to contrive the same sentiment. The second presupposition to arrive at authenticity with a shift away from the center is that media translations are not the linear consequence of an embodied center. Rather, that mediation can become pre-eminent by itself, becoming the center from which embodiment originates. Hamna Khalid’s “Our democracy has been hacked” is an example of this. Sitting affixed in front of the neon glow of a television screen, Khalid addressed this mute object with a refrain about anxiety for the future. Repeating the same phrase over and over again, Khalid programmed her bodily action according to a pre-configured script she had set for the performance. The action of the body thus became subservient to the mediation of text. 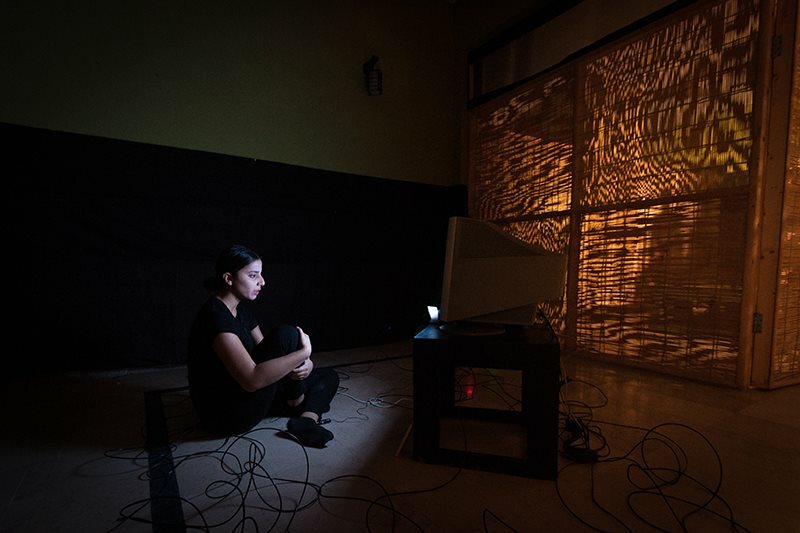 Khalid’s performance spoke to the history of video art before the internet. This is when the ubiquity of the television screen and its one directional address is engaged in the project of nation building around the world. These constraints stimulated many artists to try domesticating the TV and to talk back to it. Perhaps, we’ve come full circle to the same point as promises of democratized networked media and political representation are fading with the rise of the new right and centralized corporate control. The future in sight is bleak and inescapable. The third presupposition is that perhaps there is no center at all. Authenticity has no site. It is as likely to be found in the body as in any degree of mediation. If the originary center is not the privileged container of presence, then the self is a fugitive in a decentralized network of mediations. Thus, any mediation has equal probability of yielding this presence. Maha Sohail’s “She stood like a healing drop of sun split on the sky floor” corresponded to these ideas. 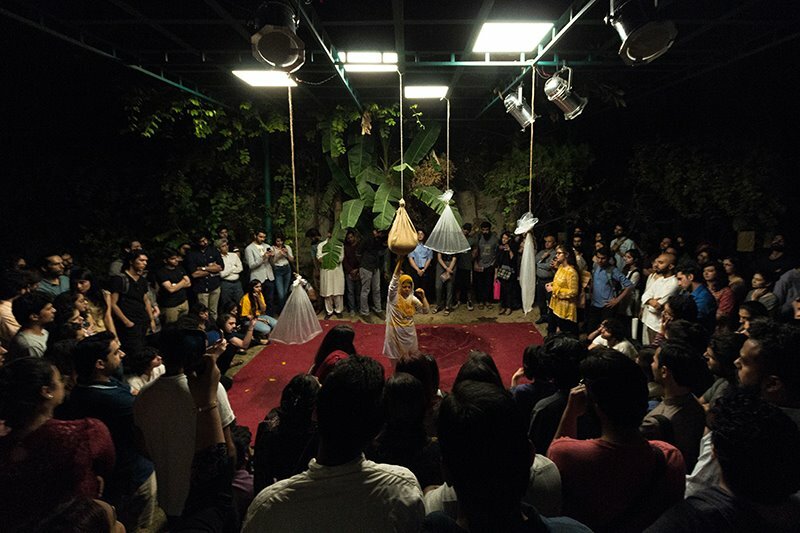 Sohail performed under an elaborate set up with plastic bags full of water and a jute sack full of turmeric hung around her. Dressed in white, she positioned herself underneath these and stabbed them to split them open upon her. Meanwhile, she also recited lines from a text that spoke about the mythical beginnings of time and the universe. The three mediums i.e. the body, materials and language found instrumentation through each. The work would lose meaning were any of these was to be subtracted. Sohail’s performance spoke about birth and origin as a meeting of binaries. Within her recitation, there was reference to a meeting of desert and ocean but turmeric and water can similarly signify a number of such dualities: yolk and whites, warmth and cold, sun and sea, cleansing and coloring to name a few. Other artists included in the exhibition were Abrar Ahmed, Ahmed Khan, Ajiya Asif, Arsalan Afzal, Waleed Sajid and Aisha Suria. My intention of using notions of locating presence as interpretative frameworks has not been to categorize the works in the exhibition. On the contrary, I hoped to think through some knee-jerk assumptions about the emotive qualities of a body especially a female one. What is being offered and what is expected by the audience? Does performance become automatically subscriptive of risk and injury, or are there ways in which performance artists blur the division between presence and mediation to offer affect but also escape?